I really enjoyed your article. . .one thought. .. Marcus’s story is not over yet. Many times in life things that seem like they are bad end up being good in the long run. God works in mysterious ways is all I’m saying. I hope this is the case for Lattimore. Go Gamecocks! Thanks for the read and the comment, I certainly hope and trust that you are right! Why do bad things happen to good people? Because, and you are right, that’s life but when bad things happen to good people, what goes around comes around and a lot of times what comes around is something better then what you just left!! Not being an overly religious person myself (read: except in situations of indescribable pain or seemingly life threatening situations), I still like to believe that there is some connecting force in the universe that binds us all. A balance. Why do good things happen to good people? Because bad things happen, and it’s the good people who can handle them. 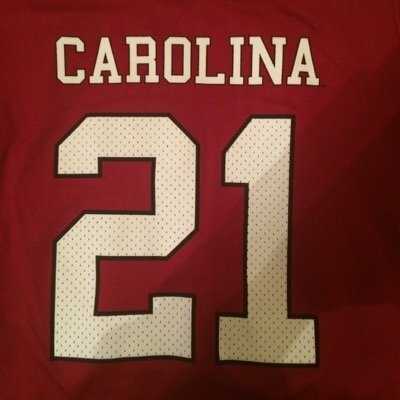 I’m incredibly saddened by the too-soon end to the Marcus Lattimore’s football career. I feel cheated, and all fans of this game should feel cheated that they didn’t get to see more of him. But I will always remember what Marcus did for me as a fan. I’ll always remember Mark Bradley’s line in the AJC (“I saw Herschel. I saw Emmitt. I saw Bo. Now I’ve seen Marcus Lattimore.”). All the touchdowns, all the amazing runs. But more than that, I’ll remember what Marcus did for HIS university. HIS community. The story of Marcus Lattimore the football player is a tragedy, and no one should forget that. But the story of Marcus Lattimore the human being is yet to be told. And if there’s anyone who can rise from tragedy and turn it into victory, it’s Marcus. It’s funny, my dad and I have always bonded over Gamecock football. And it’s still the primary topic of conversation between us. And when it came to Marcus, one thing we would always talk about is how amazing Marcus was around the goal line. No one I’ve ever seen was as good at getting into the endzone when the ball was inside the 5. And that’s because Marcus is a finisher. And while his end-game is not what any of us expected, least of all Marcus, I’m sure, I have no doubt that he’ll punch the ball in, because that’s what he does. It’s terrible that this happened. It’s maddening that someone like Marcus couldn’t get his fairytale ending. But I think the reason so many Gamecock fans moved to the final stage of grief so quickly is because it’s Marcus. And we know, better than anyone, 21 will find a way to score. Doggone it, thats better than what I wrote! Thanks for the reflection. All I can say is outstanding! In reality, there was only one good person and they killed Him. I do appreciate Marcus Lattimore and his arrival at USC made a huge impact on the program. I hope the Gamecocks will hire him in some capacity.